Is that time of the year, when the temperatures are starting to drop and the wardrobe needs to be in step with the crazy transitional weather. Layering is always the best solution: the day could start cool but you have no idea how it could change, improve or even get worse. 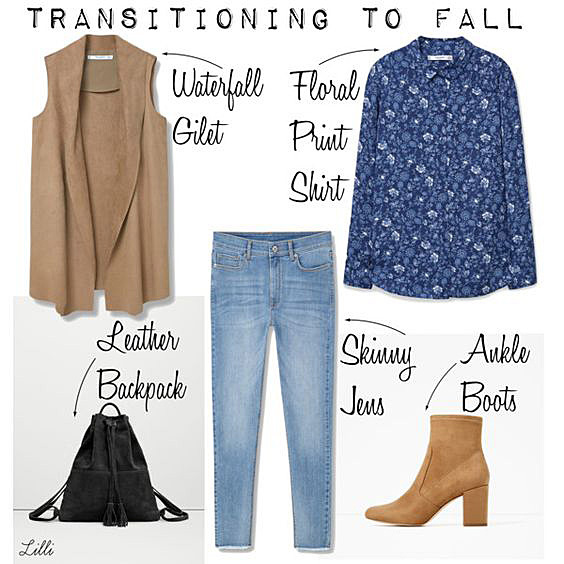 The items above are basic and a good option for these days; I especially love the floral shirt and the ankle boots, classic and timeless must-haves for fall. La camicia a stampa floreale molto bella! It's getting cooler. I like the vest and suede boots. So cool and chic. Mi piace questo look trans-seasonal... adoro le camicie stampate!!! you are so right. In the morning I need a jacked and a few hours later it's very warm. Last weekend I carry all my sandals and summer shoes in boxes. I definitely don't need those shoes this year. Your selection is pretty nice. My favorites pieces for fall are also the booties and the blouse. My transitional outfit has been a leather jacket or a trench coat and with an added scarf. Luckily the weather is very mild where I live and like today I still managed to leave the house with shorts. Yes, layering is totally the key! In love with choices you presented us! Fall has already started in Latvia - today was the first day I wore a scarf and fall boots! Missing summer a bit, but I am excited for the fall fashion!